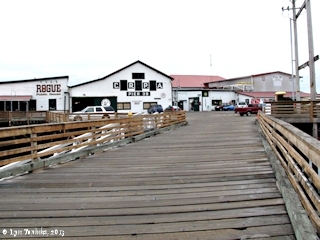 "Columbia River Packers Association, Astoria, Oregon"
Click image to enlarge Original Hanthorn Cannery buildings (on left), 39th Street, Columbia River Packer's Association, Astoria, Oregon. View from moving car. Image taken October 25, 2011. In 1899 seven canneries in Astoria, Oregon combined their plants and equipment to form the Columbia River Packers Association. "The Columbia River Fishermen's Protective Union went on strike in 1896 to demand higher prices for their fish, in light of the diminishing Chinook runs on the Columbia. The cannery owners were ineffective in their efforts to deal with the union as a united front and the fishermen were given a slight increase in their take. 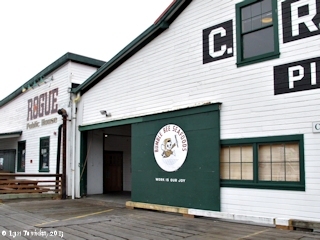 The outcome of this strike made the large Astoria cannery owners inclined to form a cooperative agreement amongst themselves. In 1899 the Columbia River Packers Association was incorporated; it was comprised of seven canning companies with ten canneries along the Columbia River and a large plant at Bristol Bay, Alaska. Samuel Elmore was the organization's vice president and was a major force in bringing the cannery owners to the agreement. Particularly notable about this new venture was that each participating owner was either bought out or given stock equal to the value of their cannery and their land. The company then centralized operations, using the Elmore plant as the main cannery and using the other cannery locations for uses such as office space and cold storage." 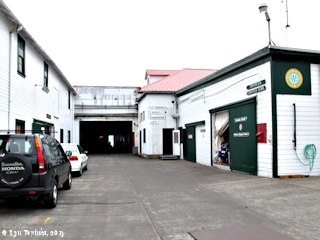 Source: U.S. National Park Service website, 2013, National Historic Landmarks Program, Samuel Elmore Cannery. "The Dalles times-mountaineer, Saturday, June 20, 1896"
The Columbia River Salmon Packers to Consolidate. "PORTLAND, OR., June 12 -- A gigantic salmon combine, to take all interest on the Columbia river into one corporation, and backed by unlimited capital, will very probably be the un-looked for result of the present strike of the 3000 fishermen who want more for fishing than the packers claim to be able to pay. The prospects are that the Columbia River Packers' Association, which was formed in Portland last spring, is to be followed by a stronger concern -- a single corporation which shall be so firmly entrenched as to command a vast influence in the salmon industry, and which will dictate and not be dictated to. It will be modeled after the Alaska Packing Company, and it will absorb all the big and little fishing interests, consolidating them into one enormous plant and do business on an unprecedented scale. The salmon-packing combine is not an undreamed-of possibility by any means. The fact is, the scheme is ripening for consummation. One of the wealthiest canners on the Columbia declares that the strike has hastened this end. The cannerymen are being driven into consolidation for protection of their interests not only from the fishermen, but from the mischievous state legislature, and by next autumn it is confidently believed -- no matter what becomes of this year's fishing -- that the combine will be organized and the consolidation effected. The plan has been on foot for some time. If organized in time, as it is sure to be, the combine's lobby will be a factor in the state legislature this winter, and endeavor to influence the solons to legislate in the interests of the fishing industry. Therefore, the fishing season of 1897 may be inaugurated under totally different circumstances from those under which this season began. The formation of such a trust is a utmost consequence to the fishing industry and there is no doubt that this consolitated company will exercise a good deal of influence in the salmon markets of the world. It is known that the leading cannerymen favor the consolidation, and it goes without saying that any co-operative, independent, middle-of-the-road or river, anti-concern that manifests a disposition to buck against this company, will be forzen out in the regulation way and forced to come in or cease its existence." Source: "The Dalles times-mountaineer", Dalles, Oregon, Saturday, June 20, 1896, courtesy of "Historic Oregon Newspapers" website, 2013. "The Morning Oregonian, Tuesday, January 23, 1900"
"Astoria apparently is tiring of the salmon trust. The combine is not showing up the way the people and the cannerymen who put their canneries into it thought it would. As a result, several of the old-time packers are looking for locations on Puget sound, and the trust is reported to be figuring on closing down several of its plants for the purpose of reducing expenses. "It is a well-known fact that nearly all of the canneries went into a combine one year ago. Some of the cannerymen received part cash and part stock. Mr. Elmore took $350,000 in stock in the combine, and he and Mr. Hammond virtually own the entire salmon business of the Columbia river. What will be the result? In less than two years, every salmon packing company on the Columbia river will be driven out of business, and Hammond and Elmore will do the salmon business of the Columbia river. By the organization of the combine, B.A. Seaborg, M.J. Kinney, J.W. Cook, George & Barker, J.O. Hanthorn and the Scandinavian cannery have been driven off the river, their canneries closed, and they are making arrangements to start canneries on the Sound. Over $1,000,000 will be taken out of Astoria this year and invested on the Sound. B.A. Seaborg was driven out of the city, M.J. Kinney was driven out of the city, J.O. Hanthorn was driven out of the city and George & Barker have been driven out of the city for the reason that they went into the combine, and are now sorry that they did so." The trust, or combine, as it is called by Astorians, is known as the Columbia River Packers' Association. It was organized in January, 1899, with $2,000,000 capital. Shortly after its organization, it absorbed the canneries of the following persons and firms: J.W. and V. Cook, B.A. Seaborg, J.O. Hanthron & Co., Fishermen's Packing Company, Elmore & Co., M.J. Kinney and George & Barker. Some of the canners received money, and all of them took stock. In the process of absorption about $1,700,000 of the stock was issued, and the remainder is being held in the hope of getting hold of the independent canneries on the upper and lower, particularly the latter. The canneries which did not join the trust are the Cutting Packing Company, A. Booth & Co., Fishermen's Co-operative Packing Company, P.J. McGowan & Sons, F.M. Warren, Pillar Rock Packing Company, J.G. Megler and Seufert Bros. The principal objects of the trust are to reduce expenses and control the output and prices. Whether the trust succeeded in cuttind down expenses last year is known only to its officers, but it signally failed in the effort to control the output and prices. It packed 102,000 cases of the spring pack of 278,800, and 17,500 cases of the fall pack of 41,350 cases. Its total pack was 119,500 cases of a total pack of 320,150 cases, or 37 per cent. The price of raw fish was forced very high last year by the competition of the cold-storage men. This competition reduced the pack by 35,000 or 36,000 cases. The annual meeting of the stockholders of the combine will be held at Astoria next Thursday. Little in addition to the usual routine business will be done, but it is expected that the directors to be elected will keep four of the combine's seven canneries closed this year. Two will be run at Astoria and either the Cook cannery, at Clifton, or the George & Barker plant, at Eagle Cliff. Cannerymen who understand the situation say this policy will save money to the combine, as it will enable it to dispense with a number of superintendents and clerks and reduce the number of employes in the canneries and of fishermen on the river. The combine affects Portland's interests to a large extent. In old times, when the canneries were independent, Portland's banks did a business with the canneries about equal to the value of the salmon pack. One effect of combination has been to make New York the financial headquarters of the Columbia river salmon industry, instead of Portland and Astoria. A.B. Hammond, the promoter of the Astoria railroad, is the great magnate of this trust, and his financial connections are with the East and not with Oregon. It is intimated that when the trust gets things arranged to suit itself, it will establish company stores and require its employes to patronize them. If it should do this, a severe blow would be given to Astoria's trade. However, there is no confirmation of the report, and it is referred to here only because the plan has been suggested as one within the power of the trust. The trust may do with its canneries as it pleases, as it has a lead-pipe cinch on them, but it cannot keep their former owners out of the packing business. George & Barker, J.O. Hanthrn, B.A. Seaborg and M.J. Kinney are looking for locations on Puget sound. It is reported that they have found good ones not far from Port Townsend. J.W. Cook is looking over the Sound country, but his plans have not been revealed. C.W. Fulton, of Astoria, who was in town yesterday, said the closing of several of the canneries would not seriously affect the salmon industry on the Lower Columbia. "Three canneries can handle the pack of the Lower Columbia and do the work much cheaper than seven can." said Mr. Fulton. "The pack would be the same, the price paid for raw fish the same and the number of fishermen and boats the same. the only difference would be that the number of superintendents and clerks would be reduced. Not more than 20 men would be affected." Senator Fulton took no stock in the report that the combine is contemplating the establishment of company stores." Source: "The Morning Oregonian", Portland, Oregon, Tuesday, January 23, 1900, courtesy of "Historic Oregon Newspapers" website, 2013. According to the "Bumblebee.com" website (2013) the history of Bumble Bee began in 1899 when seven canners in Astoria formed the Columbia River Packers Association (CRPA) and set out to fish and process salmon. 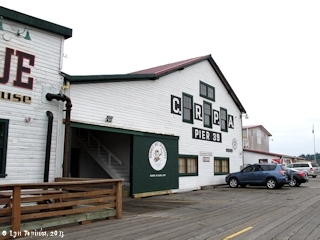 In 1900 they purchased several sailing ships and began building a cannery on Alaska's Bristol Bay, and in 1910 the Bumble Bee Brand was born as one of the CRPA marketed labels. At the same time Albacore tuna was discovered in seasonal abundance off the Oregon coast. By 1920 the CRPA began expanding its cannery in Astoria to capitalize on the Albacore. Between 1930 and 1950, Albacore surpassed Salmon as the company's principal product and Bumble Bee became one of the most respected premium labels for canned seafood. In 1960 the first Bumble Bee Seafoods, Inc. was formed, and throughout the 60s and 70s the company grew, acquiring other canneries. In 1980 Bumble Bee suspended canning operations in Astoria, the location where it all began. 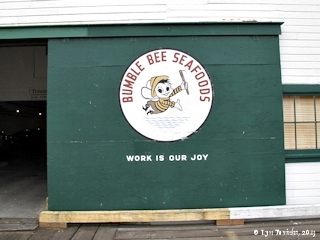 Bumble Bee continues today as Bumble Bee Seafoods, LLC, and, by 2004 it became the largest branded seafood company in North America. Click image to enlarge Columbia River Packer's Association, Pier 39, Astoria, Oregon. The Hanthorn Cannery and BumbleBee use to be at this location. Image taken July 30, 2013. Click image to enlarge "Bumble Bee Seafoods", Columbia River Packer's Association, Pier 39, Astoria, Oregon. The Hanthorn Cannery and BumbleBee use to be at this location. 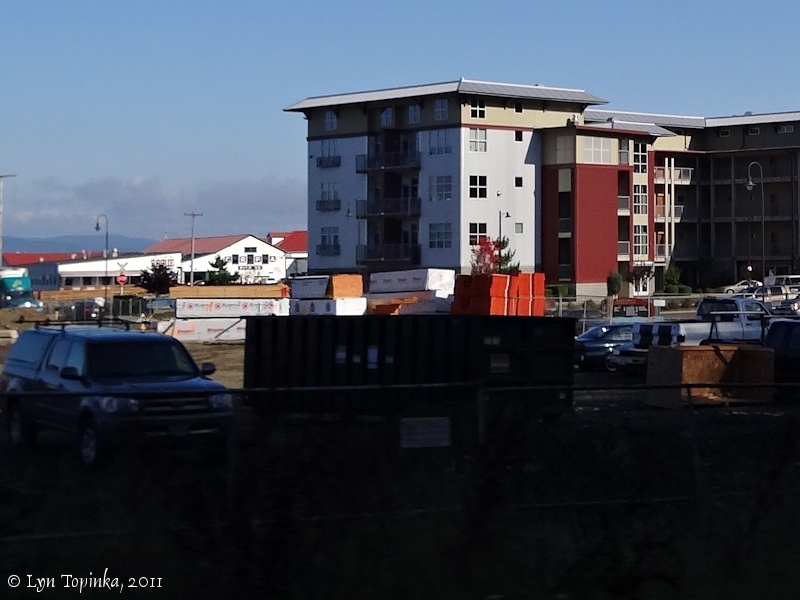 Image taken July 30, 2013. The J.O. Hanthorn Cannery was constructed in 1875 at the foot of 39th Street, Astoria. 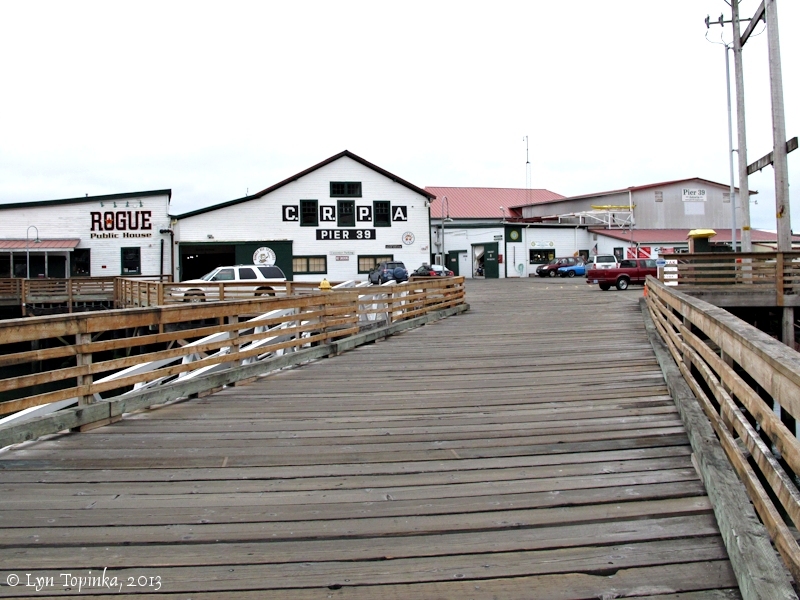 In 1899 this early cannery joined the Columbia River Packer's Association and was then used as a cold storage plant. 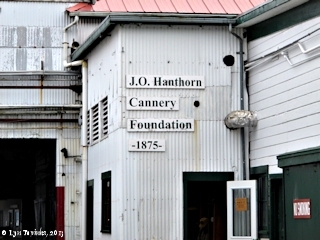 In 2003 the Hanthorn Cannery Foundation was formed to preserve not only the oldest cannery building left, but also preserve the history of Astoria's canning industry. "CRPA employees and managers established the Hanthorn Cannery Foundation in 2003. This organization seeks to preserve canning industry history and establish an interpretive center in Astoria. 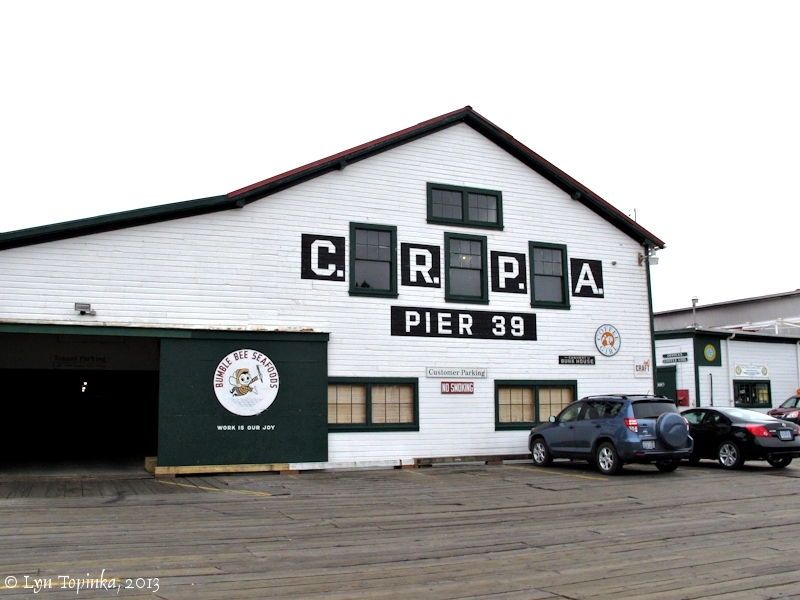 The foundation also maintains the Hanthorn Cannery building, the oldest extant waterfront structure in Oregon (built 1875), and the last original CRPA cannery."